Vacuum measurement and monitoring is one place an analog meter has advantages over digital. With an analog gauge it is very easy to see the characteristics of the system regarding moisture and atmosphere to determine the level of dehydration and degassing that is being achieved. Also a system that leaks under a vacuum is easily identifiable and additionally the presence of a tight system with or without moisture. For proper evacuation and dehydration of refrigeration and air conditioning systems, an electronic vacuum gauge is an indispensable companion to a vacuum pump. Significant dehydration does not occur until a vacuum of 1000 microns or greater has been achieved. Use of electronic vacuum gauges is the only way to determine when dehydration is occurring and when it is complete. Vak-Checks are precision thermistor vacuum gauges designed especially for refrigeration and air conditioning service. They automatically compensate for changes in ambient temperature and permit continuous monitoring during evacuation. 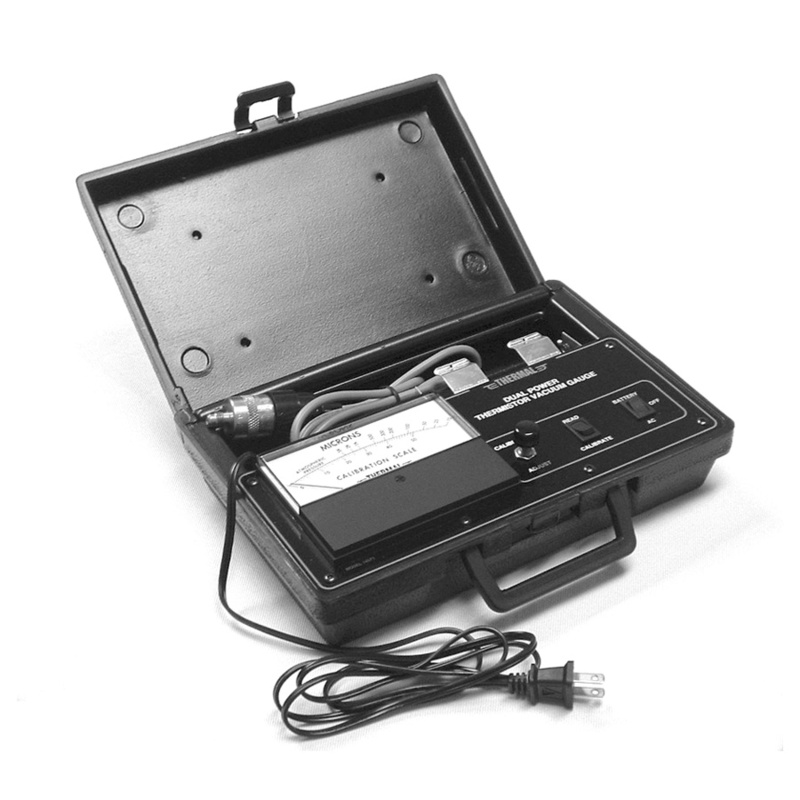 These instruments are compact, lightweight, easy to use, and read directly in microns on a large easy-to-read meter. This analog thermistor vacuum gauge allows you to choose between 110AC and battery as your power source with the same features as the Model 4501. These micron gauges use highly accurate and durable thermistor technology that has a long proven history of reliability. 450 TruReward$ points will be placed in your account when you buy this item.